BOBCAT #70 ; 23.5 HP KUBOTA DIESEL ENG. ; LIFT CAPACITY 700 LBS. HGT. 6'3" : WIDTH 36" : LGT. W/BUCKET 8'3" : WT. 2800 LBS. 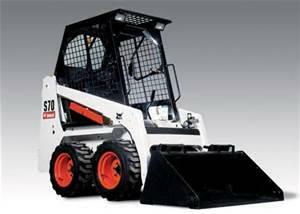 * Please call us for any questions on our bobcat s70 loader 23 hp rentals in Cincinnati Ohio.